Brilliant. So much of it looks like it would have to involve some sort of CG but it's amazing that it doesn't. I'd love to see more of this. Scott, would be nice if you elaborate a bit on some of those techniques. I've only made it through the first video so far (have to get back to work) but thanks for the great commentary. You mentioned doing articles on Matte Painting, as an aspiring Matte Painter myself I would love to hear your input!! 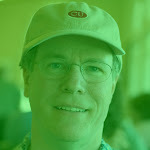 Hey Scott, I've been a reader of your blog for quite awhile now, and I really enjoy it. Loved these retro visual effects videos. Can't wait to see more on the retro effects.